Issued Sep. 17, 2013, to AT&T Intellectual Property I, L.P. 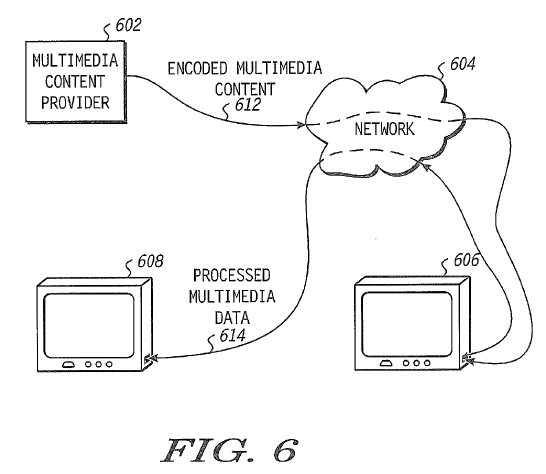 The ‘151 patent describes a system for selecting games from a content provider. A user selects a game from the first channel. The TV then displays an encrypted channel which contains data about the video game. The encrypted channel is accessed through use of a decryption key associated with the identity of the device used to access the channels. Once the game is accessed, save game information is stored locally, while the majority of data is still accessed through an encrypted channel. 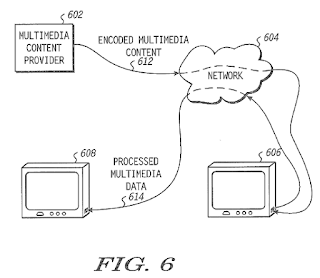 A method includes receiving a multimedia data stream at a device and sending data of a first channel of the multimedia data stream to a display device to generate a presentation of available video games. The method includes receiving user input selecting a first video game of the available video games and sending an identification of the device and a channel indicator corresponding to an encrypted second channel having video game data associated with the first videogame to a content provider. The method includes receiving a decryption key for the encrypted second channel in response to verification of the identification of the device. The method also includes decrypting the encrypted second channel, beginning storage of the video game data in response to detecting a starting byte of the video game data, and ending storage of the video game data when the starting byte is redetected. ending storage of the video game data decoded from the encrypted second channel in response to re-detecting the starting byte.